Have you ever bought anything from Urban Outfitters? I checked their website and they seem to have quite a diverse array of stylish clothing for young people. Young people with money, that is. The company seems to have a handle on what this market segment likes. 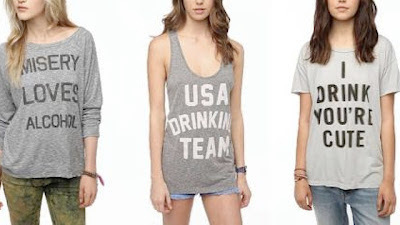 Maybe since most teenagers are still searching for their identity, preferably a cool one, perhaps the marketing geniuses at Urban Outfitters figured that a lot of young women would want to send the message that they're heavy into really cool adult behavior, like drinking alcohol. And maybe they assumed that since teens aren't famous for good judgment, the kids wouldn't connect the dots about alcohol being illegal, addictive, and potentially dangerous. The gentle folks at Urban Outfitters know that drinking booze doesn't make you cool or adult-like, it just makes you drunk. But they're probably betting that most kids haven't yet learned this perspective. But their parents have. The Mothers Against Drunk Driving (MADD) were outraged that clothing that glorifies drinking was being marketed to under-aged kids. The Huffington Post concluded its article with a poll about the t-shirts. 46% indicated "Inappropriate." 54% indicated "No big deal." This is the culture we live in. People haven't got the word that teen brains are still developing, just as the brains of unborn children are still developing, and alcohol and drugs can derail normal development. The area under development in the teen brain is the area at makes them smart. Disturb that area during adolescence and the kid could end up stupid - for life. Seriously. I'm assuming that the executives at Urban Outfitters weren't thinking about consequences like this when they decided it would be good business to sell t-shirts that glorify drinking alcohol to teens. They were just thinking about making some easy bucks off their innocence and gullibility. Cute:) For me, it`ll be great for college wear.